Enjoy the flavors of pumpkin pie in this pumpkin pie chia pudding. I’m declaring the first leaf has fallen and it’s time for all things Autumn, which means pumpkin! 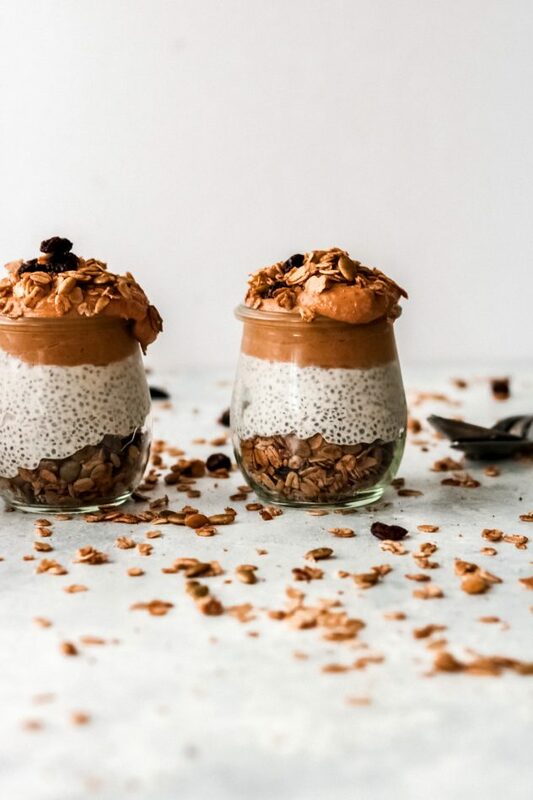 This pumpkin pie chia pudding brings you all the flavors of pumpkin pie without all of the work. 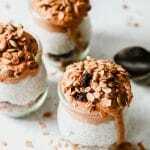 The pumpkin pudding layer tastes just like pumpkin pie, the granola topping mimics the crust and the vanilla chia pudding is just like the whipped cream topping! The pumpkin pie layer, made with pumpkin puree, tastes just like pumpkin pie filling. Next is the vanilla chia pudding. 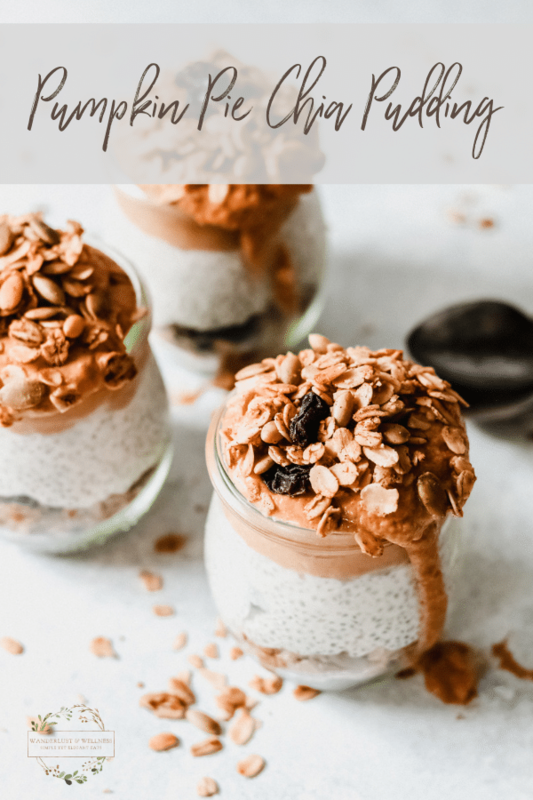 If you’ve never had chia pudding it’s very similar to tapioca pudding in terms of texture. The bottom layer is a cinnamon and raisin granola which mimics the crust of a homemade pumpkin pie. If the granola looks familiar, that’s because it’s the homemade cinnamon and raisin granola I posted earlier on the blog. It’s such a versatile granola and perfect for the Autumn season. Of course, you can either use this granola or your own, whichever you prefer. I mean, look at those layers! So, so good! What is your favorite pumpkin dessert? Try these additional chia snacks, too! In a small mixing bowl, combine the pumpkin pie layer ingredients and stir to combine. Cover the bowl with plastic wrap and store in the refrigerator for at least 30 minutes. In another small mixing bowl, combine the vanilla chia pudding layer ingredients and stir to combine. Cover the bowl with plastic wrap and store in the refrigerator for at least 30 minutes. 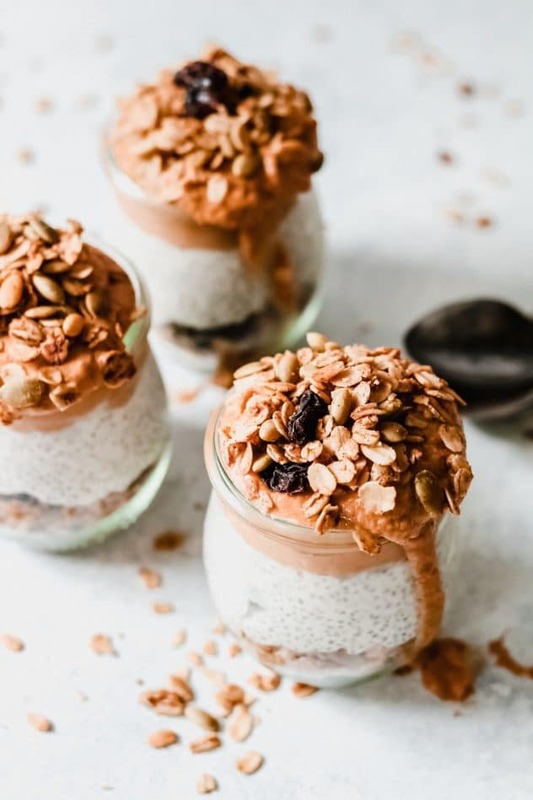 Once the chia pudding has thickened, begin assembling your pudding parfaits. In 4 small jelly jars or similar, add 1/4 cup of granola to the bottom of each jar. 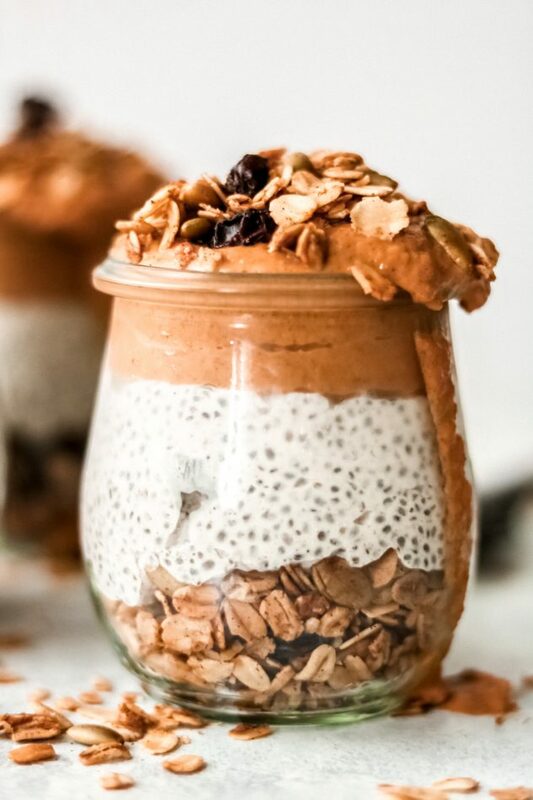 Next, spoon the vanilla chia pudding into each jar, forming the next layer. Lastly, spoon the pumpkin pie puree into each jar for the top layer. Sprinkle with granola, serve and enjoy!